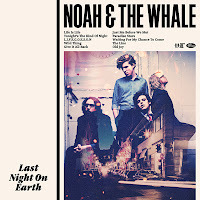 London's Noah & the Whale are quite a different band than the one that won our hearts with the charming "5 Years Time". Their forthcoming album Last Night On Earth, out March 15th, is the result of a band that's done a lot of growing in the past couple of years. Dropping by the wayside are the pastoral sounds and images of their last album. Taking their place is a much bigger, fuller sound, powered by a newfound reliance on keyboards and other electronic effects. That hits you right away with the lead track "Life Is Life". It's a more forceful sound from the band, but one that feels triumphant. Not to worry, the pop sensibility still underlies most of these songs. Despite the synth on "L.I.F.E.G.O.E.S.O.N. ", it's really the band's trademark breezy pop that endears the song to you. Though the piano riff of "Tonight's the Kind of Night" is a complete "Baba O'Reilly" rip-off, it's still impossible to resist. "Give It All Back" is brimming with a fun energy. The new sound doesn't work nearly as well when Noah & the Whale slow the tempo. Tracks like "Paradise Stars" and "Wild Thing" sound dated with a palpable '80s kitsch. Unfortunately, the kitsch pushes a little too far, treading into the cheesy territory. 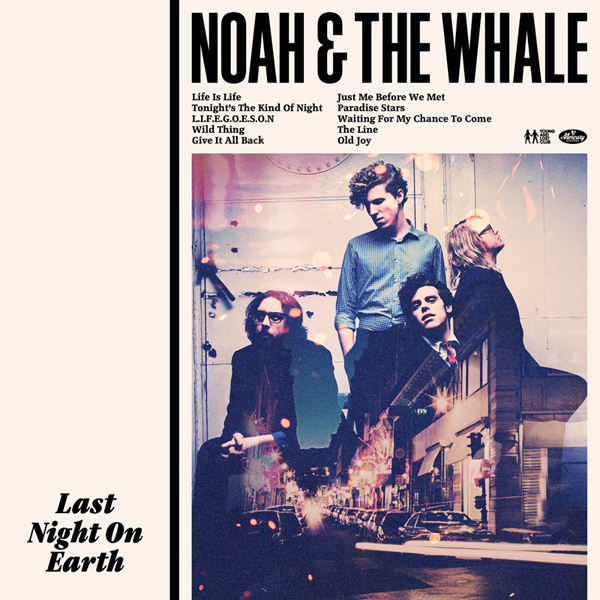 Noah & the Whale are a band that has been getting better with every album. Last Night On Earth is no different. In fact, it may very well prove to be the band's breakthrough. Best tracks: "Life Is Life", "L.I.F.E.G.O.E.S.O.N." I really loved Noah and the Whale's last album "The First Days of Spring". It was probably one of my favorite albums of 2009. I'm excited to hear what they have in store for us with their newest album!